I chose a Hoyo De Monterrey Le Hoyo Du Prince to smoke after an epic ride that began today not far from home at Lake Sonoma and looped through Healdsburg, Geyserville and then ran up along the northern California coast. It The ride was one of our local Grasshopper Series–minimally supported, suffer-fests that attract pros and amateurs alike. The pros get points for placing near the top and mere mortals like myself can brag that we survived over a cold beer at the finish. Ascending Kings Ridge after 50 miles of hard riding was part of the fun, but the hurt began when at mile 80 ascended Skaggs Road–which is one of the most brutal and unforgiving climbs in Northern California. We’d already done 8,500 vertical for the day but still had another 25 unforgiving miles to go and about 2,000 additional feet of climbing (and gradients hitting over 20%). Midway through the climb my friend Skip and I were asking ourselves, “why in the hell do we do this to ourselves? !” But there is something about pushing yourself to your absolute physical limit and testing your mental strength that is really addicting. The reward at the top was a killer descent where we hit speeds up to 50 miles and hour and raced to the finish where that cold beer was waiting–and my Du Prince. 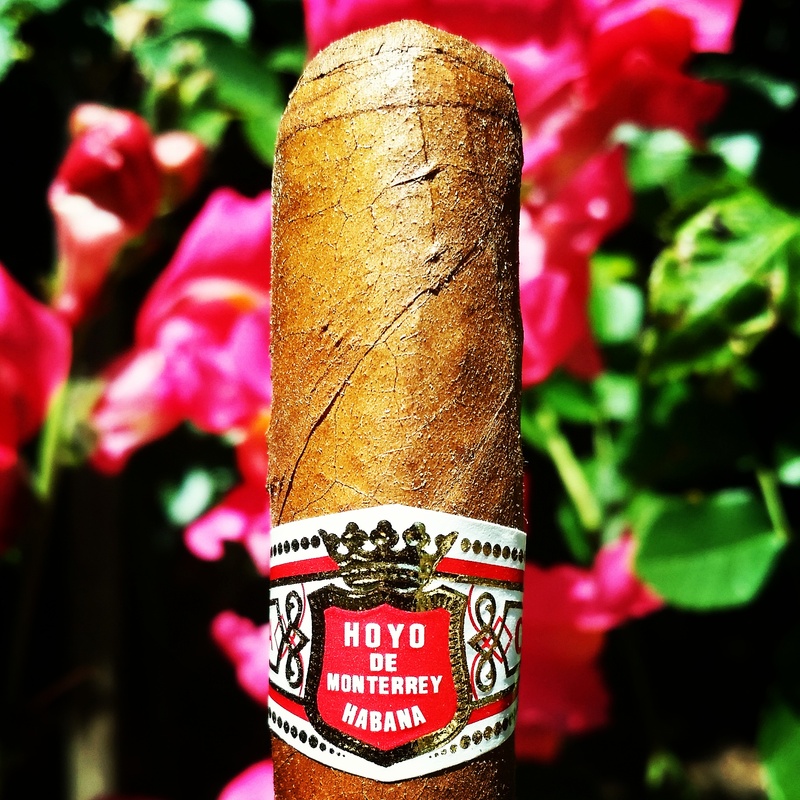 I think I’ve mentioned that the Le Hoyo Series is my favorite of the Hoyo De Monterrey range. They age incredibly well, have a unique and unmistakable woodiness, and possess real class. Truly special. Not to mention that they come in a small array of quite esoteric sizes, and all are presented in banded cabinets. The Du Prince is an Almuerzo vitola (40 RG x 5 1/8)–the same length of a petit corona but with a slightly smaller ring gauge–and I really love the way it feels when rolled between the fingers. Balanced. The vitola I chose for this tasting has been aging for 3 1/2 years which is just the right amount of time for some of the woodiness to start mellowing out a bit. When really young the woodiness can be a bit sharp on the tongue and agressive. Wrapper is oily and lightly veined, and the body is taught and firm. The Du Prince always feels “snappy” and light in the hand, and this one is no exception. The aroma before lighting is wood, burnt caramel, light spice and toast. A little side note: the lighter I always choose to light this vitola is my Dunhill Rollagas. The Rollagas has such an iconic design–I love its diminutive size, lines, and its retro look. Its also has a standard flame (non torch) which works well with this cigar. When I hold the Rollagas in my right hand, flame gently burning, and the Du Prince in the other, it feels good. After lighting, I get alot of wood on the tongue and more burnt caramel and a little leather. As things get going, the ash is nice and even and the smoke is very aromatic and rich. Nice dark caramel aftertaste. And a little bitter chocolate. I’ve never tried to enjoy this cigar with anything other than a glass of sparkling water, but I can imagine that it would taste great with a cappuccino. The coffee-creaminess would be a nice foil to this vitola. Further in, wood moves even more to the forefront with a slightly piquant “ting” on the tongue–pretty standard with this cigar, and its compatriot, the Du Député — also one of my favorites. Cola and bitter chocolate start to emerge as I pass the midpoint. The woodiness just intensifies (but not unpleasantly). And I get a slight sticky sweetness on my lips. It feels a bit like what lingers on your lips when after you have bitten in to a piece of caramel. I reach the band and…whack! Once final pop of that oh so addicting wood.